The Transparent Blue will be available with the standard nibs sizes of EF, F, M, and B. As is the norm for the M205 line, the nib will be un-plated stainless steel. The trim is the standard M205 chromium-plated furniture with a single trim ring at the piston knob and a single cap band. As previously mentioned, the crown cap top will now be accented with chromium rather than the black of the original release from 7 years ago. The cap top will have the silver single chick logo against a black background. This pen will be 4.92 inches long, 5.71 inches posted, 0.46 inches in diameter, and will have a weight of 0.49 ounces. The ink capacity is quoted at 1.20mL. The asking price will be 125 € (~$135.99) for those in the European Union and 103.31 € (~$112.39) for everyone else who are not subject to the VAT. This is yet another surprise announcement of an upcoming release but it falls a little flat in my eyes as it is a repackaged release rather than something truly new and exciting. Still, many missed out on the original release and this will certainly be a second chance to own one of these great pens. The Transparent Blue has always been a favorite of the M205 line and I think the newly styled crown cap top actually has a nicer aesthetic than the original. What remains uncertain is whether or not we’ll see another M205 this year based off of the Edelstein Ink of the Year as had been previously rumored. It may be that those on the fence will hold out to see if that offering comes to the market before deciding between the two. What are your thoughts? I’ll definitely be picking one of these up for my collection. How about you? I think this pen looks beautiful. (Of course, I have a weakness for colored demonstrators!) I’ve been eyeing the older release (I’ve been seeing more of them posted to eBay recently) but I prefer the looks of this new version. I’ll definitely be purchasing one of these for myself. Thanks for posting. You’re welcome. I agree that the newer version looks a bit sharper than the older one. Look forward to seeing it in person. I like the blue demonstrator; it’s very pretty, and I like the chrome crown on top as well. I am partial to blues; however, I like teal/turquoise/aqua blues much better, so I’ll be waiting to see if there will be a release based on the 2016 Aquamarine ink of the year. If one is made available, I will definitely be purchasing an Aquamarine Pelikan. I’m also excited to see if we get an Aquamarine M205. That has the potential to be brilliant. It’s always tough when so many great releases come out in relatively short order. I already own the old one, the new release will be more in line with the Pelikan image as of 2015, of course a transparent version gives you an inside view of the working of the mechanism. It always is a surprise by seeing the mechanism working. In combination with the new Edelstein ink (Aquamarine) it will be a great combination. It’s always funny to me just how polarizing demonstrators are. I enjoy them which is why I own quite a few. It seems that in the fountain pen world, people either love them or hate them with a great divide between. Oh, this one is lovely. Even better than the original. Thanks for breaking the news. Pelikan is causing me all sorts of trouble with lots of beautiful pens coming out for a limited time and at the same time. I can’t buy them all and I can’t make my mind about which one to get :). And as soon as you do decide upon one, they go and release another. I guess there are worse problems to have. What’s puzzling is that the blue plastic used looks different in this re-release compared to the 2009 model based on the picture, but Pelikan claims that they are using the same transparent blue resin. Is this perhaps just a difference in lighting? The product shots usually look a little different than the actual photos. I’d expect the blue to be the same light blue of the previous release. That’s why it’s always helpful to see the product in person or photos before passing final judgement. The M600 pink is a good example of that. 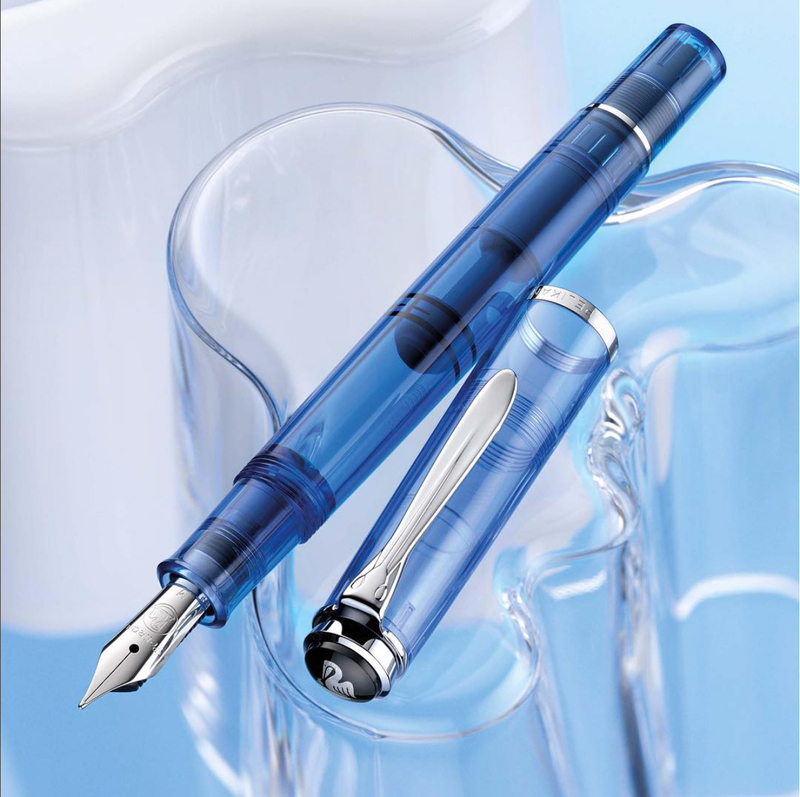 I just bought a 2009 version of this light blue demonstrator the week before this announcement! I feel like this color, compared to my darker colored demonstrators (like M205 Amethyst and M200 Blue), looks better inked up than it does without ink. When I looked at pictures of it for sale I was on the fence until I looked at pictures people had posted of it inked up. Then I fell more in love with it’s look. I am *really* hoping that the rumor of a Aquamarine demo this year turns out to be true. I would hit the preorder button in a heartbeat. I’m very interested in seeing an M205 Aquamarine too. The Amethyst was announced last June so I’m expecting something in a similar time frame this year but that’s just supposition on my part. Hard to believe that the Amethyst is only one year old. I’ve still got my fingers crossed for an Aquamarine, though! I hope we will be hearing some positive news very soon. Not that Pelikan is on any particular time line but we heard about the M205 Amethyst around mid-June last year. If they keep the same schedule, it might not be much longer of a wait to hear about an Aquamarine (provided the rumors are true). I’ll be watching! It’s my favorite color, and I’ve been hoping for an Aquamarine pen ever since they put out that color ink. I’m soooo tempted… I really, really want a demonstrator, though I’d prefer a clear one of the 600 series, really. Just now my budget plans are against my pen plans, somehow. But since I’m on my continuous search for my perfect blue ink, having the blue demonstrator might be a good idea. Though I might actually wait if that aquamarine demo turns out to be true, since the color might blow me over, too. If I give in to my inner collector, I might just go for both… can’t have too many pens. I agree, get ’em both! ha ha I’d love to. It’s making me conflicted…I want to wait and see if they put out an aquamarine version, but then if they don’t, I’ll want the blue one, and it might be hard to find by then. Well, Joshua, I guess what you said earlier is right, we could have worse problems to deal with! That thinking is exactly why I have a M605 in M and B 🙂 I was conflicted as well. The horrors of decision 😉 I probably wouldn’t be that conflicted if it was a gold nib, amusingly enough. While their steel nibs are fantastic, I do prefer the Souverän gold nibs. They are just that little bit better for my writing style. We started because “they’re so pretty!” And, “look, that one’s a limited edition, and it’s numbered!” And so forth. It is an expensive hobby, isn’t it? But isn’t it fun to open up a new pen, shipped right to your door? Oh, the addiction…I need another new pen! OK, I just bought one of these. The big question is: What ink for the maiden voyage? One of the Edelstein blues? I’m thinking that Iroshizuku Ama Iro (Sky) would be a nice match, too. Choices, choices! A rather nice problem to have. Congrats on your new pen! I vote for Ama-iro. It’s my current favorite ink. Of course my “favorite” changes now and then, but I have to say Ama-iro would really play up that pen! And yes, that is a very nice problem to have, isn’t it? I’m thinking Diamine Blue Velvet, personally. My pen just arrived and I’m really happy with it. It writes, as all my other Pelikans, like a dream. 🙂 As promised I gave a little first peek on my site. Now I’d really like a clear one sometimes… for the pretty colorful inks other than blue 😀 I’ll try to resist. For a while. Glad the pen finally made its way to you. Loved the little write up. Enjoy it! Do you think Pelikan will produce the Pelikan M205 Clear Transparent Demonstrator Fountain Pen with the chrome finish I missed out on getting one. It seems to have been popular, but will they do it again? No word one way or the other but you never know. I don’t think it would necessarily be in the near future though since they reissued the M200 clear demo just a few years ago. The old ones come up for sale from time to time if you keep your eyes open. Oooh, I hope so! I’m still waiting to see if they’re going to do an Aquamarine M2XX, but I’d love to see a clear demonstrator as an M205. Or even with gold trim, that would be nice, too. I’ve seen their demonstrator in the M800 series, but that one’s out of my budget. Pelikan re-released a gold trimmed M200 clear demo in 2012. Still able to find a number of examples online for sale. Oh, thanks, Joshua! I’ll be sure to keep my eye out for that one. A clear demo with gold trim would be unusual and beautiful; different from the usual chrome/clear combo.